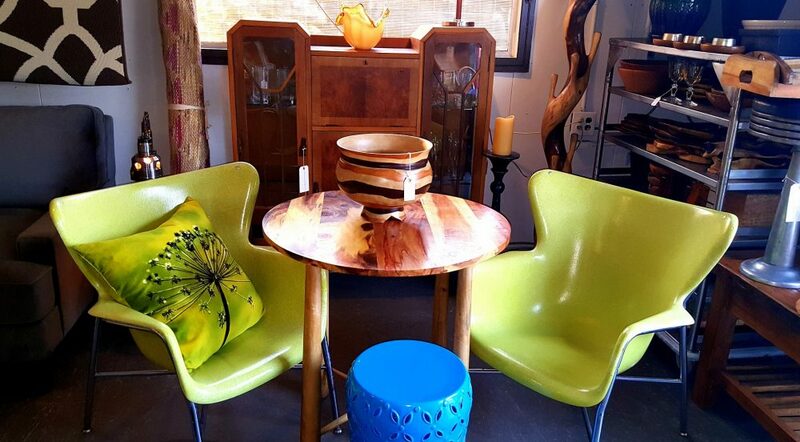 It’s summer playtime in the Gorge, and with our time and resources at a ‘premium’, think about making one-stop at Mosier’s Old Gas Station where you’ll find a stellar collection of locally sourced, gently loved home furnishings at ‘low octane’ prices. It’s like going to an Estate Sale but better – the selection comes from homes all over the gorge, all gathered in one location. So you get to choose from a diversity of design styles and price ranges while shopping local for treasures consigned by your neighbors! Here’s what Gorge Dwellers have brought in for consignment this month … Oversized Vintage Leather Chair w/Nail heads, Large Shabby Chic Cupboard, 1950’s Mod Sectional Sofa, Mid Century Coffee Table and End Table, 1940’s Drop Leaf Table with 5 leaves and original table pads in pristine condition, Butcher Block Kitchen Cart, Kitchen Aide Stand-Up Professional Mixer, Farm Hutch, Pair of Rod Iron & Wood Slat Outdoor Benches, Large Fountain, Primitive Wood Storage Tower, Entry Table with Shelves/Baskets, Tall Distressed 3 Drawer Cabinet, Pair of Funky Retro Barstools, Cool Mirrors, Lamps, Wood Futon Frame with New Thick Mattress, Antique Washstand with Marble Top, Farm Cabinet, Western Contemporary Bedroom Set, Night Stands, End Tables, Hand Painted Cabinet from 1990’s by Hood River artist Mark Nilsson, Modern Leather Barstools, Chunky Rustic Sideboard with Wine Rack, Round Wood Table + Chairs, Antique Chinese Elm Sideboard, Vintage Art Nouveau Red Cast Iron Bed, Antique Desk, Butterfly Chair, Potted Plants, Candleholders, Stained Glass, Large Collection of Beautiful Tiles, Art, Old Trunks, Kitchen Accessories, Linens, and who knows what else will roll in the door this weekend!